The new Voice Memos app focuses on your vocal waveforms rather than fancy skeuomorphic microphones. 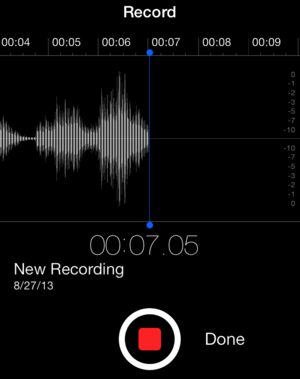 The Voice Memos app uses the black background favored by Contacts and Stocks in iOS 7, using white and gray text along with blue and red accents. The app features a simple black timeline bar with a blue playhead; tap the red record button, and gray waveforms are recorded along it. You can start and stop a recording at any time by tapping that big red button again, though it won’t save until you tap Done. Once you do so, Voice Memos prompts you to name it, and then adds it to the memos list, which takes over the screen on smaller devices, leaving only the record button at the top. Tap any of the recordings to play, share, edit, or delete them. By default, the recording plays through your device’s speaker; you can enable or disable the speaker (or any other audio source) by tapping the speaker icon above the list. 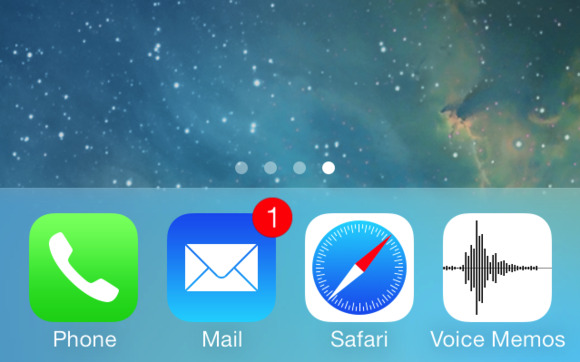 The Share icon, as in iOS 6, provides you with iMessage and Mail sharing, along with a new AirDrop option. You still can’t post audio to social networks, and, sadly for GarageBand fiends, there’s no way to export voice memos to the GarageBand app. You can rename your clips by tapping once to select them, and then tapping once more on the title to bring up the keyboard. You can also tap the blue Edit link to changes titles with a single tap or to delete multiple recordings. You can trim your memos, but you can’t cut them and move tracks around as you can in GarageBand. 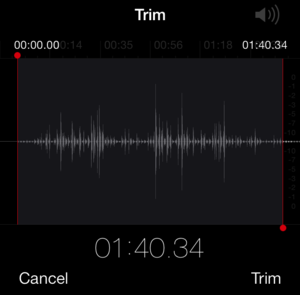 Voice Memos does make it easier to edit your recording, which is a nice perk. As in iOS 6, you can’t cut and move clips around, but you can trim the beginnings and ends of a clip more easily—useful if there’s lots of clicking and clacking while you’re trying to stop recording. When you tap Edit, the timeline pops back down, and you can tap the Crop button to turn the blue playhead into two red edit handles, one at the beginning of the clip and one at the end. Once you’ve arranged them to your liking, tap Trim to exit editing mode with your new clip. Unfortunately, there’s no way to make a copy of your clip when trimming, so whatever edits you make, that’s what you end up with. Tap Done to return to your list of clips.